In Mannino's hand, a simple spoke wrench (above) can do wonders for bike performance. A chain measurer is his most-used tool, since a chain is the first thing to wear out. Allen crank and wrenches, tire levers and a chain remover are essential, along with a calibrated wheel-truing stand. Only the very best physicians look over their patients as thoroughly as Dave Mannino checks out a bicycle that comes into Two Wheel Transit for a tune-up. He scans, listens, probes, spins, flexes, wiggles and squeezes the bike from tread to derailleur. With more than 31 years of professional experience, his well-practiced hands can diagnose a pit in a bearing, a wobble in a wheel or wear in the Teflon liner of a cable housing and treat the ailment on the spot. 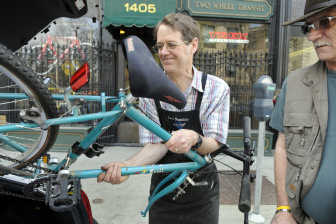 If you haven’t pedaled a bike that’s been in Mannino’s care, you may not know the true meaning of a well-oiled machine. Background: Mannino’s fancy with bicycles began at the age of 5, when his father gave him a used Schwinn Spitfire. “I couldn’t ride it — I wouldn’t be big enough to ride a 24-inch bike until I was 10 — but I recognized that it needed a lot of maintenance, so I took apart the coaster brake. I got it all shined up, but I couldn’t get it back together. “I still remember the nice mechanic at the local bike shop who reassembled it for me. “When I was 15, I got new spokes and built my first set of wheels for that bike. It had a hard life. It did a lot of ghost riding (downhill without a rider), because it went straight real good. I still have that bike. “In fact, I’ve collected boys and girls matching pairs in the same color for each of the bike’s sizes — 20, 24 and 26 inches. I have five daughters and a son, and we’ve all ridden our cruisers together to church, the girls in their dresses and all…. First bike job: 1977, hired by Jim Spearman of Selkirk Bergsport in Spokane. “I had an old Peugeot I rebuilt and rode while I was in college in San Diego. That was my portfolio. Inspired by: Bruce Gordon, frame builder. “In 1979, I went to Gordon’s frame-building school, camped out in a pasture near Eugene. I realized he was an artist. “I built a touring bike at the school, but I was planning to ride a lot on dirt roads so I wanted to build a frame that would handle big 650B wheels. The French called them Randonee wheels. Mountain bikes weren’t really around yet. Gordon had never built a frame like that, so both student and teacher had to go to the drawing board. Professional insight: Name-brand bikes differ in design from one manufacturer to the next, but they’re all pretty equivalent in quality. Department store bikes are a different matter. The quality isn’t there. You have to take a different approach to them. Trade secret: Patience. That’s what separates good bike technicians from the great ones. You have to have the attitude that it’s a simple machine and it’s not out to get you. Longest employer: REI, 18 years. Most valuable asset: “Experience. Everything seems kind of obvious to me now. Claim to fame: Mechanic for Race Across America star Michael Trail of Colville in 1987. Trail pedaled coast-to-coast in nine days, finishing second. Deep thinking: “I didn’t get a driver’s license until I was 18. That was about the time of the Arab oil embargo and long lines at the gas pumps. So I just continued to ride my bike at college. I mostly rode a one-speed coaster bike with drop bars. Bottom line: Minor tune-up $55 plus parts, should be done at least annually, depending on mileage. Major tune-up, including deep cleaning of parts, about $90 plus parts. Where: Two Wheel Transit, 1405 W. 1st Ave. in Spokane; (509) 747-2231.